Disappointed you didn't get a ticket to Bon Iver at Tripod? (You should be ashamed, tickets were on sale for weeks before selling out). Well if you'll admit to your shame, you can buy a ticket for Bon Iver's return to Dublin in December. The man who is know to his parents as Justin Vernon will play the National Stadium on November 3rd. Tickets cause an inflationary €27.50 (it's worth it), and go on sale on Monday. Oh and I also got my hands on Justin Vernon's album (under his own name) Hazeltons today. I'll let you know what I think! I'm sorry guys, my radar must have been broken, because I didn't hear this stalking up on me until it was right beside me. Jem's second album, the follow-up to her glorious debut Finally Woken, is to be released on Tuesday in the US. It's called Down to Earth and has already been leaked onto the internet. I only found out about it when it was being discussed in a forum I visit. How did I not hear about this? Her label must not have done too brilliant a job publicising it! Press release? I never got it... But the appearance of Vusi Mahlasela, who has worked with Dave Matthews Band, has definitely got my attention. Hopefully there's something on here that's as good as 'They'. Most of you probably don't know Keith Meicher, but he makes damn good music. It's not available in shops, and only to close personal friends (i.e. those on a big forum on the interwebs somewhere), but his latest (third album), is the brilliant follow-up to the best instrumental record of 2007, Brass Knuckle Shuffle. His new album is dedicated to the memory of his bandmate and personal friend, drummer Corin Fallow, and is yet another triumph. 7. Oh My Ears! The Clang of Construction, The Death of a Dream, Seventy Five Stories of Stories! Plus, isn't that the best album cover of the year? Bloc Party are to release a new single, and like 'Flux', it doesn't appear on an album. This didn't make the cut for Intimacy. Was it being saved for single-only release, or was it not good enough? I personally think the former. It definitely is better than tracks one and two on that return-to-form album. The single will be released October 20th, as well as making appearance tagged on to the physical release, due October 27th. Maybe it's a way of getting people to buy actual CDs instead of downloads. Enjoy. Oh God, will these reunions never end? Instead of a full-band Genesis reunion, we get dross like New Kids on the Block reforming. Were they ever big over here? I definitely don't remember it. We'll see though, as they play the O2 (former Point) on January 21st 2009. I doubt it will sell out, and fans may be treated to a Princely-pull-out. Well that's my prediction anyway. But I did get the Mercury Prize wrong, so I'm definitely prone to making mistakes. Tickets are onsale today week: Thursday 18th. Yes!!! You can now stream the entire new Jenny Lewis record, Acid Tongue on her MySpace. Forget Rilo Kiley, or even Paddy Kielty, Jenny Lewis solo is where it's at. You can catch jenny solo at the Button Factory on October 19th. And that artwork still hurts my eyes. Any chance here for me to talk about Ryan Adams. Ever hear of the Patty Duke Syndrome? No? Well, they were Mr. Adams' other band, along with Whiskeytown, Cardinals, Frightwhaler and everything else he's ever done. God he's prolific. But these videos are classics. Back in 1994 Ryan was frontman for the Patty Duke Syndrome. Both are recorded February 4th, 1994, at the Brewery, Raleigh, North Carolina. But I said that Elbow would get too much backlash from the cool kids if they won the Mercury. Well they did, and the band The Cool Kids haven't complained. Yet. Congrats to them, but I must say I'm surprised. The bookies must be delighted, as favourites Burial didn't get it this year. The Seldom Seen Kid is a decent album, but I don't think it's as good as some of the others on the lisy. That said I'm on the judging panel for absolutely nothing, so what would I know anyway? Plus, 82 on Metacritic. Maybe I just didn't give it a chance. I was probably too busy listening to Jape anyway. Singer Guy Garvey said "I had a tenner on Radiohead. It just feels great, very unexpected. You look at it in the same way as Bedouin tribes look at a pint of milk. It doesn't happen very often but it's all the sweeter. It's been a long time we've been doing it so it's cause for celebration. To the rest of the lads I'm so proud to do it with it with my best mates." No, it's not another gig announcement, it's yet another venue change. In order to accommodate a few more people, Glasvegas's Whelan's gig has been moved to The Academy. Tickets for the original venue will still work, but it'll also allow Ticketmaster to sell some more! 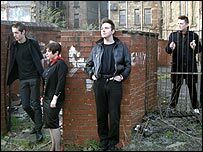 Their debut album, Glasvegas, is set to be number 1 in the UK this week. Something I definitely didn't expect, but also gives me a chance to stick my tongue out at my former editor who said "Who?" when I wanted to interview them way back in January. Did anyone catch the two new RTÉ Two shows last night? Raw starring The Rock, Stone Cold, oh no wait, it's not the wrestling program, it's a rip-off of Channel 5's The Kitchen. Raw is "raw" new drama from RTÉ - gettit? Based around the steamy lives of restaurant workers. See steamy? I am puntastic today! It stars me lad from Bachelor's Walk and me one from Pure Mule. It' a show so good, it doesn't even have an iMDB page yet. Unfortunately I didn't get the chance to watch it; I was cooking up something else (oh yeah! ), but what did my four avid readers think? On the other hand, I did catch sight of the awful Langerland.TV I will admit I was mildly amused at previous net phenomenon (at least in Ireland), 'What Have The Brits Ever Done For Us?' But last night's IRA-themed nonsense seemed like just cheap joke after cheap joke, and it didn't bring out a smile, never mind a chortle or guffaw. RTÉ and new programming rarely go together. The best ever TV show we had here was a Channel 4 production. That should tell you something. Luckily, sometimes they get it right. Now is not one of those times. I was a fan of Pure Mule and Bachelor's Walk, which will probably mean I'll click that link above and check out episode one of Raw over the weekend; but somehow I doubt I'll ever watch the clichéd Langerland ever again. This isn't my comnpetition, by any means. Just thought I'd let you know that On the Record has two weekend passes (allowing you to see whatever you want) to give away. All you have to do is leave a comment for Jim about how you're the Hardest Working Class Hero, and thus why you deserve the tickets. Free music is always good. While I'm not the biggest Travis Barker fan, I'll check out anything that's given to me for free. HINT HINT! I won't be there this weekend - I'll be heading down the country - but to everyone else, enjoy it. Some of those Scottish bands are worth the admission fee. Not to mention Fight Like Apes, Autamata, and the rest! Everybody seemed to love 'D.A.N.C.E' last year (or was it this year? Time flies. ), and now Justice are back with more of, well, the same. But that's not necessarily a bad thing. They also had that great track with Simian: 'We Are Your Friends'. So there's been plenty to like so far. If you liked anything they've done before, you should devour their new EP Planisphere, which can be streamed in full on their MySpace page. The music originally appeared at the Dior Homme fashion show. How street-smart is that? It's hard to know what to make of these guys. Some critics live them, some hate them. Some like their lyrics and music but often find it hard to understand mainman James Allan's vocals. I fall into that third category. God that is one thick Scottish accent. And I thought my bogger accent was bad! Glasvegas are set to play Dublin's Whelan's on December 14th (anyone want to buy me an early birthday present? ), and Belfast's Spring & Airbrake the following night, December 15th. Tickets down south are €15, while up north you'll get in for ten sterling. Bad news or maybe not for anyone who was planning to go to Kraftwek in Luggala. Due to the horrible weather, Saturday's show has been moved to the Royal Hospital Grounds in Kilmainham where Leonard Cohen et al. played recently. If you choose not to go to the show, you can get a full refund; and anyone who decides to stick it out in Dublin instead of Wicklow can get a twenty euro refund. Not bad, seeing as how the show will be entirely the same. Plus Kilmainham is a great venue! EDIT: Thanks Gerry, seems I don't know Irish geography.